Our Semi-Dedicated plans are for those who want the full power of a dedicated server along with the convenience and security that a VPS provides. These servers include large amounts of guaranteed RAM suitable for mission-critical applications. Semi-Dedicated servers share an ultra-powerful hardware node with no more than 8 other servers, giving each server at least half a Xeon CPU to itself. Our semi-dedicated plans put you in the drivers seat of your own powerful server. You have the power to install any software you wish. VPSVille staff will ensure that your server works correctly and the network connection is fast and responsive. 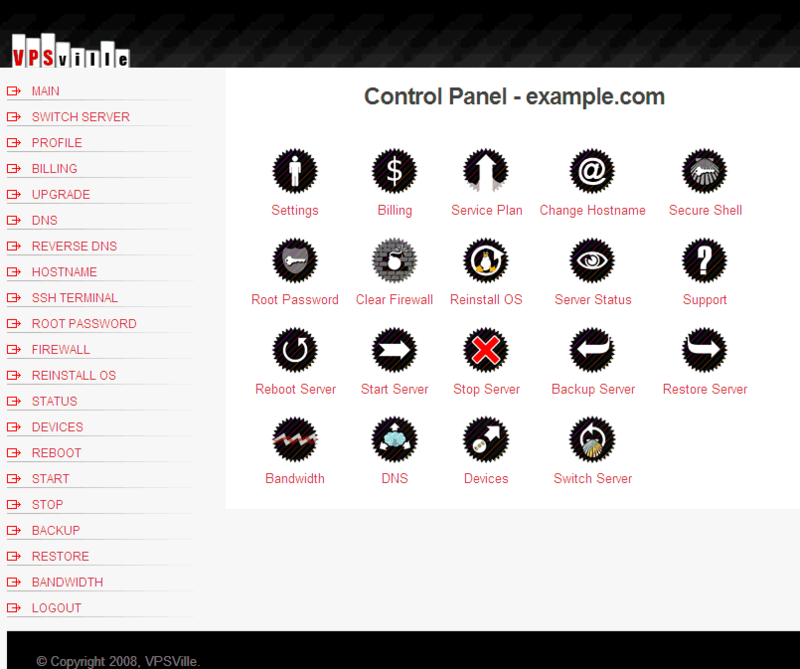 You will have access to backup and restore operations from our control panel. Setup Fee: Free! Free! Free! Free! Free! Our Slackware Linux based VPS by Patrick Volkerding is an advanced Linux operating system, designed with the twin goals of ease of use and stability as top priorities. Including the latest popular software while retaining a sense of tradition, providing simplicity and ease of use alongside flexibility and power, Slackware brings the best of all worlds to the table. Our Gentoo Linux based VPS is a special flavor of Linux that can be automatically optimized and customized for just about any application or need. Extreme performance, configurability and a top-notch user and developer community are all hallmarks of the Gentoo experience. Gentoo is loosely modelled on FreeBSD, but using the latest Linux kernels. Good for advanced users and software developers. The openSUSE project is a community program sponsored by Novell. Promoting the use of Linux everywhere, openSUSE.org provides free, easy access to the world's most usable Linux distribution, SUSE Linux. The openSUSE VPS server gives Linux developers and enthusiasts everything they need to get started with Linux. OpenVZ is an Operating System-level server virtualization solution, built on Linux. OpenVZ creates isolated, secure virtual environments (known as virtual private servers, or VPS's) on a single physical server enabling better server utilization and ensuring that applications do not conflict. Each VE performs and executes exactly like a stand-alone server; VEs can be rebooted independently and have root access, users, IP addresses, memory, processes, files, applications, system libraries and configuration files. CERN Scientific Linux is based on Red Hat Linux, with modifications to the kernel and with additional software for High Energy Physics (HEP). Scientific Linux includes software suited for scientists and people working with scientific data. This includes FITS libraries, Graphviz, and R.